Seven photos taken in Sarajevo on the centenary of Gavrilo Princep's assassination of Archduke Franz Ferdinand on 28 June 1914. 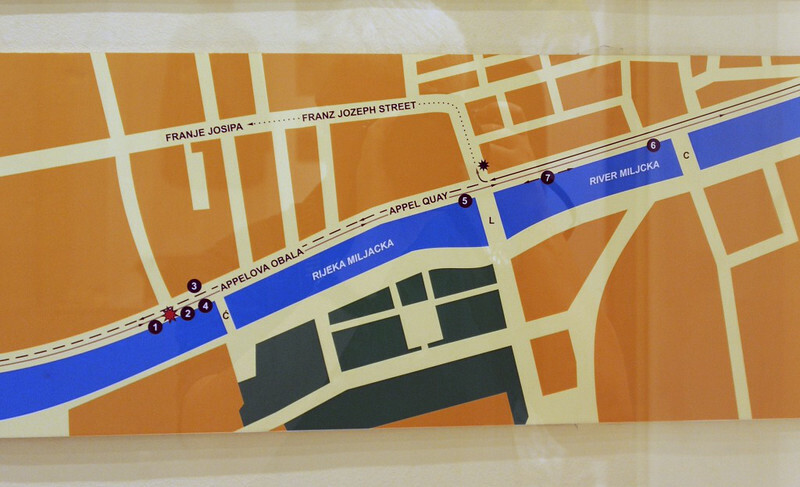 Map of the Sarajevo assassinations, 1914. Sarajevo was (and is) the capital of Bosnia-Herzegovina. In 1908 Bosnia was annexed by the Austro-Hungarian empire. It embraced much of eastern Europe, and Archduke Franz Ferdinand was heir to its throne. On 28 June 1914, Franz Ferdinand and his wife Sophie visited Sarajevo. They arrived by train, and their six car motorcade then drove east along the Appel Quay (now Ulica Obala Kulina Bana) to the city hall for a formal reception by the mayor. On the way, a bomb was thrown at their car at the spot marked by the red explosion symbol, where four conspiratos were waiting. The bomb missed, and Franz Ferdinand and Sophie continued to the city hall. It had been thrown by Bosnians opposed to Austria's annexation who wanted Bosnian independence. The conspirators received great albeit unauthorised assistance from elements within the army of the kingdom of Serbia, bitter enemy of Austria-Hungary. They supplied the conspirators with bombs and guns, smuggled them across the Austro-Hungarian border into Bosnia, and hid them in safe houses. Gavrilo Princip used one of these pistols to shoot Franz Ferdinand and Sophie at the junction of Appel Quay and Franz Josef Strasse as they returned from the city hall.